Breast cancer is a serious and scary diagnosis, but the good news is that we are learning more and more about it every day. Through extensive research by the National Institute of Health, Breast Cancer Organizations and other private and public entities, we are gaining an increasing amount of knowledge on how to prevent cancer from developing, as well as better ways to treat it. We are better at preventing cancer due to the discovery that living a healthy lifestyle can increase your risk and survival. Healthy eating habits and exercise lower your risk of getting cancer and the risk of recurrence for someone who has already had a cancer diagnosis. We now know that obesity greatly increases not only breast cancer diagnosis risk, but also of recurrence, giving women another great reason to eat healthy and exercise. More recently, it was also discovered that exercise during cancer treatment helps with memory problems and brain functionality of those receiving cancer treatment. Published in the Breast Cancer Research and Treatment journal, researchers found that those who participated regularly in moderate to vigorous physical activity while undergoing cancer treatment reported feeling less fatigue and performed better on mental exercises. 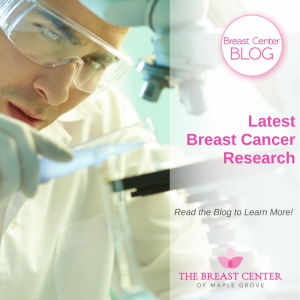 Research through clinical trials has helped us learn about genetic links to breast cancer. Some types of breast cancer develop from genetic mutations, which can be passed on in families, increasing the risk for developing cancer. A study published just this summer, by the Journal of the American Medical Association, not only confirmed that shared gene mutations increase a person’s risk of developing breast cancer, but also that the location of these mutations within the genes also matters when calculating someone’s cancer risk. Additionally, the National Institute of Environmental Health Sciences is funding a long term study called the “Sister Study”, looking into 50,000 sisters of women with a breast cancer diagnosis to learn about their environment, lifestyle and genes to gain a better perspective of any commonalities of those who become diagnosed. Researchers continue to look for medications and alternative therapies to provide better forms of breast cancer treatment, without the harsh side effects of chemotherapy and radiation therapy. One of the newest treatments for breast cancer being investigated are called targeted therapies. These are drugs that specifically target changes in the genes to stop cancer cells from growing or spreading. Several studies are currently underway to look into these drugs for use in breast cancer treatment. Set your mind at ease by getting your screening mammogram annually. By getting screened regularly you are setting yourself up for success by knowing all you can about your body. If cancer is discovered, finding it early can save your life! Don’t hesitate, call us today at 763-398-6370, or just come on in—walk-ins are always welcome!